2 bedrooms, 1 bathroom, fully equipped kitchen, BBQ, Wifi, Bch coolers & chairs! If you re looking for a clean, spacious, complete apartment rental with your own private fenced-in grass yard & deck with BBQ grill AND IS still very affordable, this is the place! And we do not charge extra for weekends or holidays. The apartment has everything you need for a comfortable stay including linens, bath towels, hand towels, basic soaps, toilet paper, hair dryer, iron & ironing board. We also provide, at no extra costs; beach chairs, beach towels, boogie board, snorkels/masks/fins & beach coolers. Along with guide books, maps, local brochures, directions to all the surfing, snorkeling, swimming beaches & waterfalls in the area to help you plan your daily adventures. We are located close to EVERYTHING (beaches, grocery, restaurants, gas stations) but still in a quiet residential neighborhood surrounded by well kept homes. You can be at your choice of beaches in less than 5 minutes. One is “Jobos” a world famous surfing beach. Visit other beaches 'Shack's, Wilderness & Crashboat'. Go golfing or horseback riding on the beach, also minutes away. 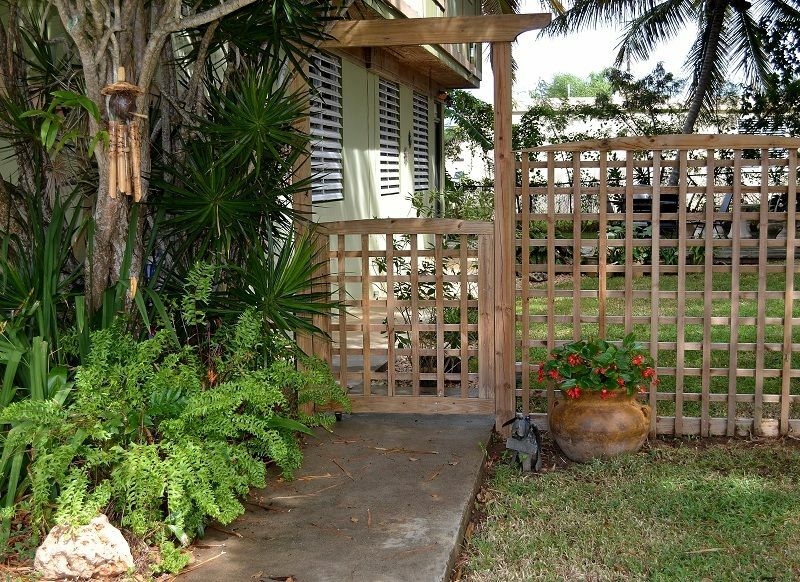 After a long day exploring, come home & enjoy the tropical breeze in your own private fenced-in yard on the deck under the huge shade tree. There are many restaurants in the area or cook at home in the kitchen that has everything you need from pots to spices, or have a BBQ on the deck. So come and escape & enjoy an inexpensive Caribbean vacation that offers you all the conviences of a true home-away-from-home and explore our beautiful crystal clear beaches & some of the best surfing. This little corner of the Island is still undiscovered by the commercial tourism market where you will meet some of the friendliest Locals & Travelers alike. Tom and I visited Puerto Rico for years, traveling the Island. Every trip ended up with us staying in Aguadilla, longer and longer. The last time we visited we decided we wanted to stay and buy a home here. Our ideal place would be a house close to the beach but in safe friendly neighborhood were we could take evening walks. We also wanted a large yard with shady trees so we could sit outside, enjoy our plantings and catch an ocean breeze. I also wanted in a house that I could make into a Bed & Breakfast or one that had a separate apartment for visiting family, friends and vacationers. One day, when driving for hours looking at houses, I started drifting off and was startled awake by Tom yelling 'That's it, That's it, That's our House!' And It Was... it was perfect. Two story home with a 1st floor 2 bedroom apartment, large grass yard with huge shade trees and just two minutes from the beach. There were neighbors out walking their dogs and mowing their yards. We found the perfect place to call HOME. Unique Benefits? Hummm... Everything! That's why we bought this home. Location, location, location... minutes from the Aguadilla Airport, minutes to beaches, minutes to grocery store & restaurants. Our house has an In-Law-Apartment, perfect for our family, friends and Guests to enjoy while visiting Puerto Rico. 'And I do all the work, cleaning... ' The apartment has it's own private fenced-in yard, clothesline, outside sink/rinse area, large wooden deck and BBQ. Shade trees, fruit trees, and the wonderful Trade Winds. The apartment is fully stocked with everything you need for a complete and comfortable stay, just bring your clothes & of course your bathing suits. 3 minutes to Shacks Beach & Jobos world famous surfing beach. We sit approx. 250 feet above sea level catching the wonderful ocean trade winds. Safe, friendly, well manicured neighborhood surround by cow & horse pastures and just minutes from beaches, grocery store, restaurants, BQN. Dish Satellite with Sirius Radio. Children Beach Toys, Dominos, Cards. Grass yard, coconut & fruit trees. Clothesline, outside sink/rinse area. We also provide beach chairs, coolers, boogie board, snorkels/ masks/fins, all at no additional cost. Holly & Tom are extremely friendly and welcoming. It is apparent they care about ensuring guests have all the necessities, and some extras, when staying in their apt. From the stocked kitchen, to the beach gear and more, our short getaway with an 18 mo. old was about as easy-going as it could have been. We wouldn't hesitate to come back here again, and hopefully find the time to do so. Thos property has a lot of beautiful things. We love that it was cheap, clean, neat and nice. It’s very confortable and holly is very very veryyyyy kind and friendly. The property has everything so you don’t need to worry about anything. I will come back!!!! The property was absolutely beautiful and exactly like the pictures. On hot summer nights in PR the breeze coming through and the way it's set up, I actually was cold at times. The apartment was amazing and the yard, completely private was beautiful. The neighborhood was quiet and gorgeous also. Actually a place I could see myself living. I had planned a trip with a friend but ultimately ended up traveling alone. The hospitality Holly showed me was just amazing and she made sure my trip was too! She is one of the most amazing people I have ever met. I've already started planning another trip and can't wait to go back to Holly's beautiful place. It truly was like Paradise..
Super clean, great location, safe neighborhood, great host. Positives: I stayed with my Mom, my Dad and my two boys (7 & 4). The place is ultra clean. Cleaner than my own house and that is a lot to say. The host was super accommodating with our arrival time. Her replies to inquiries and messages was timely and almost immediate. The place is located in a very safe and quiet neighborhood close to great restaurants and beautiful beaches. Negatives: the place is located really close to the airport BUT is not a busy airport. You hear 1-2 planes at night and that is all. The place is also located near a field of grass. When we arrived it had rained heavily, so there were bugs trying to get in to the place (some were successful). However, I liked the fact that it was in a somewhat secluded area away from a busy street. And generally, bugs are a real problem with any place you go in the Island. Owners and neighbors have dog which bark at night when the planes pass. Besides that, the dogs arent really a bother. The place does not have air conditioning. If you travel in the summer and are not used to the heat, this may be a problem. Overall, I would probably stay here again in the future. You get a lot of space and convenience for the price. If your looking to be near most beaches and restaurants around Aguadilla/Isabela without paying to be right on the ocean this is a great place! Holly and Tom were extremely attentive hosts (but never bothersome) and clearly wanted to make sure we had an enjoyable stay. I usually stay almost directly on Shacks Beach and thought it would be inconvenient to not be there but I didn't mind at all. The neighborhood is quiet and safe, the apartment is private, and the drive to Shacks/Jobos is easy and quick. I would recommend this house to anyone. From a nicely furnished kitchen to beach chairs and snorkeling gear provided, Tom and Holly are wonderful hosts who have thought of almost everything. The two bedroom apt is very comfortable, and clean. Great eating places and lovely beaches are just minutes away. Nice neighborhood too .